Whereas The Walking Dead featured an original story and cast of characters set in the same universe as the comics, The Wolf Among Us pulls many familiar faces and settings from its source material. Fables’s decade-long mythos is vast, but the elevator pitch might read as follows: fairy tale characters were exiled from their mystical homeland centuries ago, and have been living among us ever since. In this case, “fairy tale” is shorthand for popular works in the public domain, as characters from The Wizard of Oz or Washington Irving’s short story, “The Legend of Sleepy Hollow” also make appearances. It is on this premise that The Wolf Among Us operates, with only a passing reference to the comic book’s Big Bad that spurred forth their exile in the first place. Therefore, in a world in which Once Upon a Time, Grimm, and now Sleepy Hollow air on competing networks, this should be approachable to anyone without foreknowledge of the comics (though fans of Tom Mison’s Ichabod Crane might be a tad disappointed in Fables’ iteration of the character). The Wolf Among Us even has the DNA of a procedural drama tucked under its fantastic mythology and aesthetic, something that should be familiar to fans of the latter two shows. For my part, I went into The Wolf Among Us as someone who enjoys Fables quite a bit–even if I’m a little behind. I read the “deluxe” volumes as they are released, so while I am not privy Fables’ latest storylines, I feel that I am deep enough in the established mythos to understand and recognize the characters featured in The Wolf Among Us. More importantly, I’ve found that this knowledge has influenced my approach to the game in ways I hadn’t anticipated. For example, as The Walking Dead’s game-specific protagonist, Lee, I found myself making decisions based on what I thought would keep the group together the longest. Sometimes, this backfired spectacularly, and Lee and I would have to salvage whatever disaster we had wrought; in fact, this became one of the game’s greatest pleasures. By constrast, by playing as Bigby Wolf, a character with over a decade of established motivations and relationships, I found myself asking not what I wanted to do at each turn, or even what was best for the situation. I based my decisions on what I thought Bigby would do from what I knew from the comics. This doesn’t necessarily work to the game’s detriment or benefit, but it provides a new way of roleplaying that I hadn’t considered before. 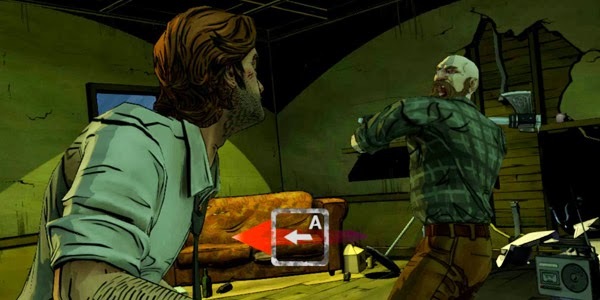 While TellTale seems to have its conversation mechanic down to a very satisfying science, I was also interested to see how The Wolf Among Us would tweak The Walking Dead’s frantic combat to fit its setting. Between its timed conversations with characters and frantic encounters with zombies, The Walking Dead proved that “quick time event” (QTE) wasn’t a dirty word, if only through its judicious application–too many might have tipped the scale into gimmick territory. Fortunately, The Wolf Among Us also continues this balancing act, but in a slightly more nuanced way. For instance, combat in The Walking Dead was almost exclusively instigated by jump scares. A zombie would suddenly come stumbling out of a dark corner, and the player would be tasked with frantically hitting Q or another key to avoid becoming lunch. The Wolf Among Us doesn’t have these jump scares, but it does have fights with hulking, mythically powerful drunks. The stakes are still high, but not always deadly. As a result, where QTE are traditionally used as a cheap way to avoid an instant death, those in The Wolf Among Us rarely end in a game over. The final product is something that reminded me of the best bits of Uncharted 3, a game that treated its QTE as prompts to nail the perfect fight choreography. While I am frequently prompted to hit specific buttons at certain times during a fight, it feels less frantic, and more appropriately scrappy and, dare I say, cinematic. It contributes to the idea that this is a tough fight between two men who are not going down easily, if only because the human body is resilient–the popular Fable body even more so. Arguably above all else, The Wolf Among Us is a beautiful game. Its aesthetic is fully realized and brought to life in a way I wouldn’t have necessarily expected. While the very first arc in Fables was a murder mystery, the series quickly grew to include stories of romance, espionage and war. I don’t know if I would have thought to narrow the scope of the game to a genre piece, but it certainly works. Everything from the bold, harsh lines and neon lights, to the John Carpenter-esque score* contribute to a beautiful noir setting that underlines The Wolf Among Us’s central murder mystery. Moreover, its script and committed cast go a long way to sell the social and economic struggles of fairy tale characters in 80s New York. The world of The Wolf Among Us feels as lived in as it is lovely. To the shock of no one, episode one ends in a cliffhanger. Surprisingly, though, it is a cliffhanger to which those who are familiar with the comics and those who are not will have two completely different reactions. Though I’d prefer that we stop shoving women in refrigerators, the multilayered cliffhanger works surprisingly well–it leaves me wanting to know how they will explain this seemingly blatant disregard for the canon, while I imagine new players will still be excited to unravel the murder mystery. I’m very interested to see how TellTale will continue this balancing act as the season progresses. *As a Mac user, my chance to play was further delayed, so I had only tweets retweeted by TellTale Games–like Shane Ryan’s–to go by. Now having played through the game, this description is exceptionally apt. This entry was posted in Now Playing and tagged telltale games, the walking dead, the wolf among us. Bookmark the permalink.